Today is National Popcorn Day & I am too darn excited not to post something about it! Being an enormous fan of popcorn & a health nut, I couldn't let this "holiday" go by without sharing my favorite healthy popcorn recipe. If made properly, popcorn can be delicious & healthy. It's full of fiber, low in calories, gluten free, vegan, sugar free, low in fat, and high in satisfaction. I prefer to use my cast iron pots / skillets to give myself a little dose of iron as well. But you can make this stove top in any of your favorite cook wear. The below ingredient amounts will yield 2 - 3 servings but double or triple it for more. 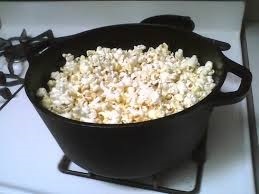 Just be sure you have a pot large enough to hold the popcorn once it is completely popped. If I head to the movies, I make this & put it in my purse. If I just feel like a snack or light dinner, this is one of my go-to favorites. If you seal it in an airtight container it can last up to 3 or 4 days. However, I can assure you, mine have never lasted that long! Cast iron sea salt popcorn!